I spent ten days on the Pinot Trail in Oregon’s Willamette Valley in late July and there were three words on everyone’s mind: heat, Chardonnay, and (the) French. There were a number of other trends noted as well including, (1) the proliferation of Oregon wineries (now at 702, a 45% increase in the last seven years); (2) the decreasing labor pool (Oregon winegrowers must compete with hazelnuts, blueberries, Christmas trees, and many other crops) creating more interest in mechanical viticulture including harvesting; (3) the increasing popularity of wine tourism in the Willamette Valley has led to a blitz of wine touring companies plying the Hwy 99 corridor and construction of a new 36-room boutique hotel in McMinnville, the Atticus Hotel, scheduled to open in 2018, that will have Portland-based Toro Bravo Inc’s “Third n Tasty” restaurant by restaurateurs John and Renee Gorham; (4) the upsurge in investment in Oregon vineyards and wineries by large corporations such as Jackson Family Wines (see photo below of the old and new - in the foreground an old grain silo in a field adjacent the new Jackson Family Wines soon to open 68,245 square-foot winery on the Evergreen International Aviation’s corporate headquarters' campus near the McMinnville Municipal Airport; (6) and finally, the solar eclipse for which many wineries in the Willamette Valley were perfectly positioned for viewing of this rare event. It was unseasonably warm in Oregon, with temperatures soaring to a toasty 88º-92º F every day I was there. Shortly after I left, temperatures reached three digits. Climatologist Greg Jones was quoted in the Capital Press, “The current heat wave is unusual for its magnitude and length, and may turn out to be Oregon’s most extreme since 1981.” On his blog, Jones noted, “Vineyards without irrigation might be able to handle the heat due to available soil moisture, but others will likely see some heat stress, potential sunburn on the fruit, and even leaf desiccation. The heat might actually slow down ripening as the vines often do not get fully back to 100 percent functioning for some time after a heat event like this.” Sun damage is a concern with Pinot Noir since the skins are included in the wine production. 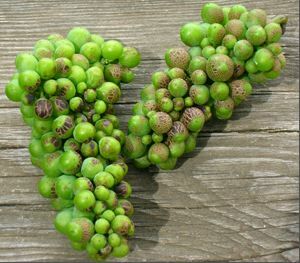 The photo below shows two sunburned Pinot Noir clusters from Hawks View Vineyard (courtesy of Anne Amie Vineyards, Carlton, Oregon). So much for “cool climate” viticulture. Chardonnay is also “hot,” in Oregon, with considerably more attention being paid to this varietal. Pinot Gris has been Oregon’s signature white grape and Pinot Gris acreage still outnumbers Chardonnay plantings, but Oregon Chardonnay is quickly gaining popularity as vintners gain more traction with this varietal. As Erica Landon of Walter Scott Wines told me, “The many changes taking place right now with Oregon Chardonnay all add up to huge steps forward for those obsessed with making great Chardonnay.” The focus is now on sites appropriate for Chardonnay with many site-specific Chardonnays available, and vineyards are now being purposefully planted to Chardonnay. Examples of Oregon Chardonnay I sampled on this trip were striking. Oregon Chardonnay tends to be lower in alcohol, higher in natural acidity, with less fruitiness, ripeness and oak influence than it’s California counterparts. Oregon is still searching for optimum combinations of site, clone, rootstock and winemaking to realize Oregon’s full potential for Chardonnay but the next ten years will be telling. To read more about Oregon Chardonnay, visit www.princeofpinot.com/article/1821/. Frenchies are now entrenched in the Willamette Valley and their influence is widely felt in the most recent vintages they have had a hand in. 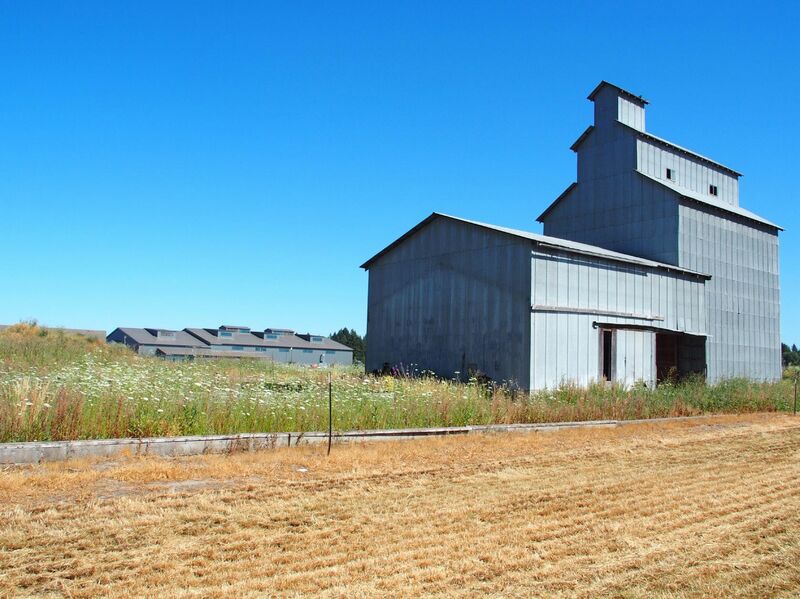 It was two centuries ago when French explorers and fur trappers first traveled into Oregon territory and settled. Before the Oregon Trail brought many English-speaking settlers into the Northwest Territory, much of the European population in Oregon spoke French. According to Zeb Larson (“French Twist,” Oregon Quarterly, Winter 2014), “Even the name Oregon may be French. Historian T.C. Elliott theorized that Oregon was a bastardization of the French word ourigan, meaning hurricane or windstorm.” The twentieth century has brought a new wave of French to Oregon, a group of veteran winegrowers and vignerons who see the potential in Oregon for the finest Pinot Noir outside of Burgundy. 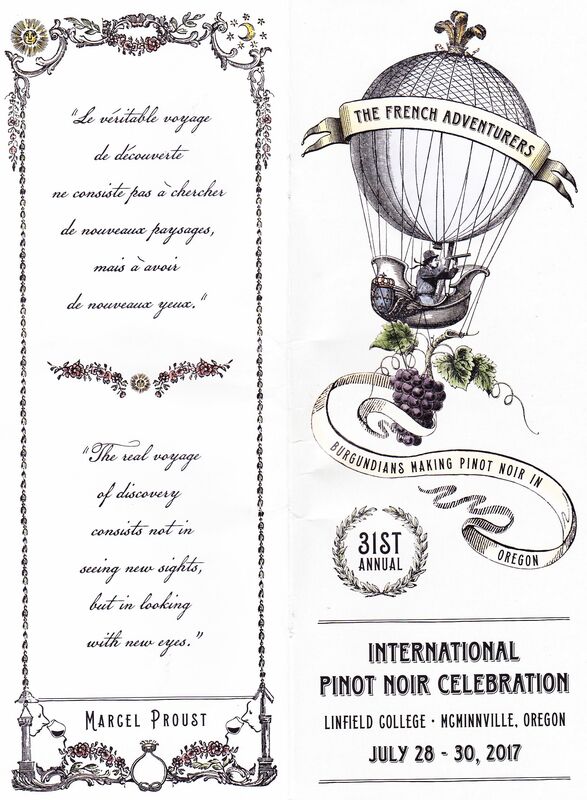 It seemed only timely that the theme of this year’s 31st Annual International Pinot Noir Celebration (IPNC) was “The French Adventurers: Burgundians Making Pinot Noir in Oregon.” Held at bucolic Linfield College in McMinnville, Oregon, this year’s event was one of the best of many I have attended. Appropriately, Allen Meadows, considered the authority on Burgundy and publisher of Burghound.com, was the Master of Ceremonies. He addressed the 830 attendees on Friday’s opening day, emphasizing the importance of producing wine that speaks of place, wines that can only be from one place, rather than obsessing about scores and competitive advantage. Read on for a full report on this year’s IPNC that is divided into two parts: (1) The Grand Seminar and (2) The Food.